Autumn Himalayan Climbing: Manaslu Summits, Dhaulagiri Over Autumn Himalayan Climbing: Surprise Summits! Lets start with the most exciting news out of the Autumn Himalayan climbing season, the attempt on Lhotse’s South Face. But also worthy of acknowledgment are the large number of summits on Manaslu and another attempt on the unclimbed Burke Khang. South Korean, Sung-Taek Hong, 51, along with Spanish climber Jorge Egocheaga, 49, are attempting Lhotse’s South Face. The only time this route has been climbed was in October 1990 by Russian climbers Serguey Bershov and Vladimir Karataev according to the Himalayan Database. According to his website and the Himalayan Database, these are the results of his previous attempts on Lhotse, 8,516 meters. All attempts occurred in the Autumn. 1999 South Face: reached 7,700 m – ended after supplies ran out and avalanche took some gear. Our team completed base camp on 26th Sep. There was a delay on delivering equipments to the base camp but they are ready to climb now. Previous attempts have been met with avalanche danger, and high winds. With the Himalaya a bit warmer than in previous years, the conditions could be even more deadly this season. 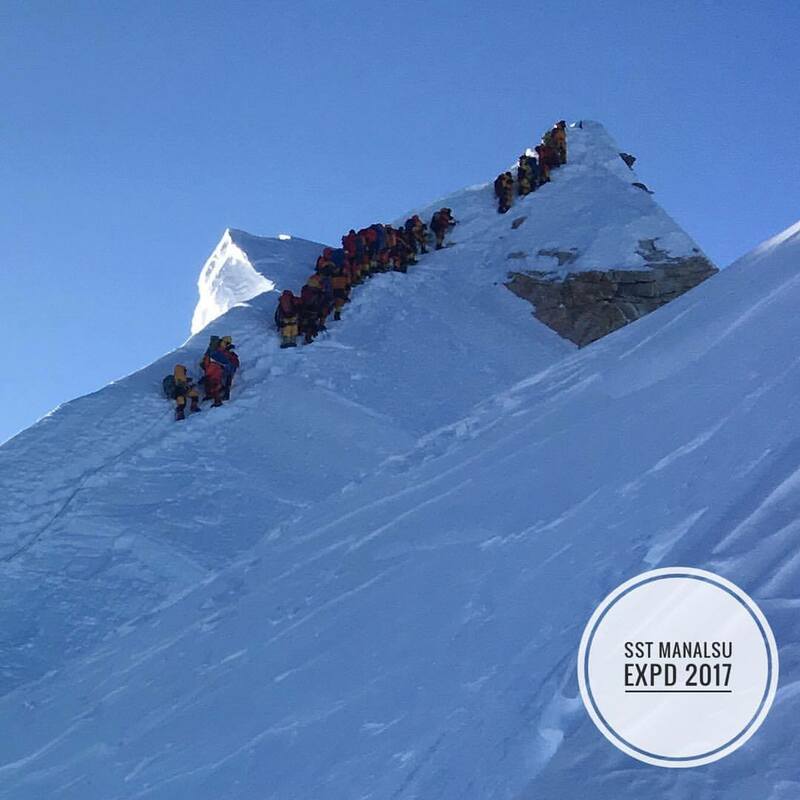 With over a week of excellent weather, teams summited Manaslu almost daily allowing the record crowds to spread out reducing any serious crowding. As I have previously noted, there were an estimated 255 foreigners with permits plus at least that many Sherpas on the mountain. It is so crowded due to China closing Cho Oyu this Autumn fearing demonstrations during a meeting in Lhasa. The most successful year thus far on Manaslu was in 2011 with 285 total summits followed by 2012 and 2013 with 121 each. There have been over 150 in 2017 with many more to come. These teams are reporting summits totaling close to 200 people. Click on the links to see the names of the climbers. Also read the Kobler post as they do a nice job of explaining their summit process, including some high winds. 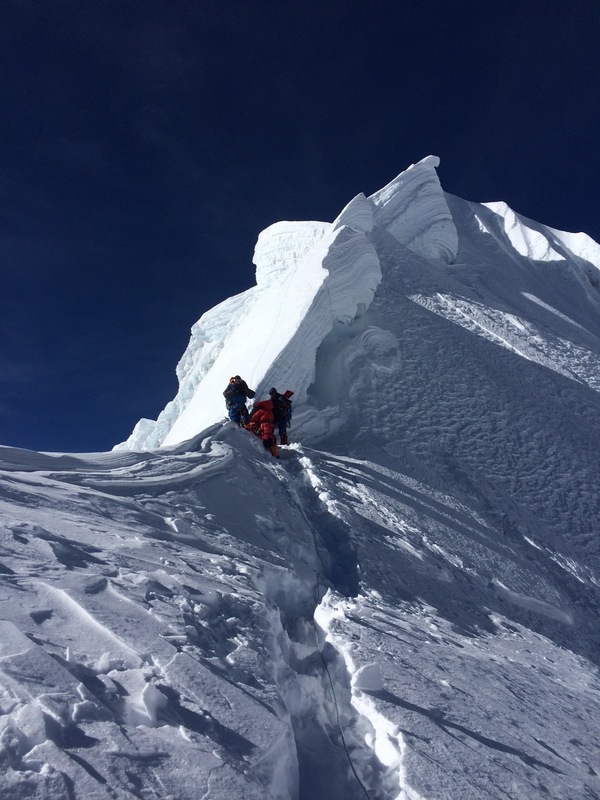 Seven Summits Club and Adventure Consultants are on their summit push now. Adventure Peaks was on the mountain but has not updated their status. Hi everyone we are all at camp 2 now and still haven’t seen anyone else this is sure a rare and great experience on such a big mountain. The route has progressively been getting steeper and the crevasse have been getting wider but over its pretty good condition considering how warm it’s been! We have been in and out of the cloud all day witch once again keep us a little cooler just as we could see our Camp our amazing Sherpa team passed us having left Base Camp latter than we left C1. 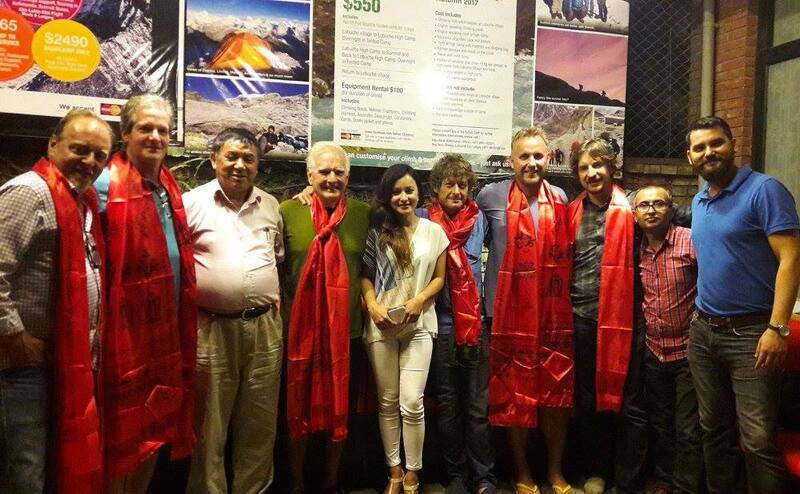 Bill Burke, the oldest American to summit Everest and live, is back in Nepal to attempt a first ascent of a peak named after him by the Nepal Government. Burke Khang is in the Gokyo Valley at 6,942 meters (22,775 feet). He has attempted it two previous times finding conditions too dangerous to proceed. I wrote a long article about their 2015 attempt. We were disappointed with the helicopter reconnaissance that was completed yesterday. The pilot refused to fly much above Camp 1 so we have no footage of the summit or the summit ridge headwall. We are considering a second recon on September 30 when the helicopters ferry us from Gokyo to Base Camp. The good news is that the route looks climbable and conditions on the mountain are very good. In fact, the lines have already been fixed to C1. The Sherpas are sleeping at C1 tonight and will start to fix the lines to C2 tomorrow. Noel is at Base Camp and will be climbing to C1 tomorrow. He has a film crew this year to document his attempt and his relationship with his grandson Olli who suffers from a debilitating disease. Noel Hanna and Micah Kershner. The film crew is Jeff Oppenheim (USA) and Alex Buisse (France). The expedition is supported by Asian Trekking Sherpas Naga Dorjee Sherpa (Sirdar), Lhakpa Nuru Sherpa, Samden Bhote and Tshering Tashi Sherpa. They will be in their base camp soon and anticipate a summit attempt around October 5th. Congratulations to all who summited and best of luck to the rest.